Richie Sleezer has been in the automotive repair business for over 40 years. He began as a technician in 1973 and after two years Richie learned the art of how to rebuild transmissions. Rebuilding transmissions until 1993, he decided it was time to open up his own automotive repair facility, and continued rebuilding transmissions for another 5 years. 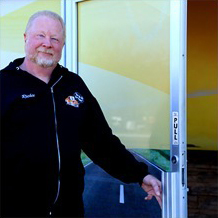 From being a Technician and Transmission Re-builder Richie decided it was time once again to make a move and moved to the front office where he interacted with the customers, scheduled repair work, and took care of the everyday office duties. Through diligent training of his personnel he has now been able to step away from working in the shop day-to-day and change his focus to the shop’s finances, marketing, and policy and procedure creations. Richie’s main objective and drive in the training of his employees has always been to “do the job right the first time” and make the customer a “Customer For Life”. In his spare time he furthers his education by attending automotive / transmission repair seminars and training classes. By working “ON instead of IN the Business” Richie also has been able to make time to enjoy his favorite pastimes: scuba diving, football, NASCAR, and life with his wife Eileen of 35 years. Brian Sleezer was born and raised in an automotive shop and in the automotive repair industry. From the early days in elementary school—where on Saturdays he started by pushing the broom and dumping garbage pails—Brian had the will to work hard and the passion to learn the business. Pretty much any time Brian was not in school he was at the shop, right up through high school, as a technician. After high school Brian went to the State University of New York in Farmingdale. In Farmingdale he had a double major of automotive engineering and business ownership. At college he delved deep into both sides of the business, technical and financial, learning automotive theories and modern business practices at the same time. 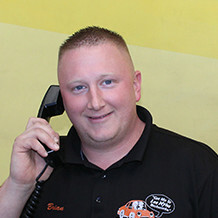 During those four years, any time that Brian was not in class he was at the shop gaining real world experience on both the business and technical ends of Bohemia Auto Care. Since graduating college Brian has also graduated from a technician working on vehicles in the shop to a shop manager and foreman, working in the front office interacting with customers on a daily basis and controlling the flow of work through the shop. For over five years now Brian has been exclusively working at the front counter in the Bohemia Auto Care Center. He continues to enjoy his job, is always growing and learning—thanks to many trips to industry trade shows and educational seminars. Brian also still attends several technical training seminars annually to stay ahead of the curve on new vehicle progresses and technology. Mary comes with twenty-five years of management experience, with over twenty years in the automotive industry. She has owned and managed her own nationally franchised shop for over ten years. Mary has a passion for helping people and easing their tensions when it comes to automotive servicing and repairs. 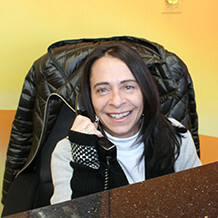 Mary is friendly and knowledgeable and will go out of her way to make the customer experience a happy one. Mary loves all animals, but she has a special place in her heart for boxers and bulldogs.